Alineadent’s invisible orthodontics treatment consists of a series of removable aligners that individually apply soft and directed pressure on the teeth, thus obtaining teeth movement and bite correction towards the desired alignment in a controlled and progressive manner. The series consists of aligners in varying degrees of thickness, which apply more or less pressure and force depending on the stage of the patient’s treatment. In the first stages, the aligners are thinner and therefore more flexible, so that the movement may be initiated more easily. The aligners are then made increasingly thicker, which progressively reinforces the desired positioning. The last one in the series also acts as a retainer. Therefore all the aligners, from the first to the last one, play an active role. One of the main assets that sets Alineadent® apart from other bite correction systems, is our state of the art technology that allows us to obtain more exacting results. The entire treatment is carried out with the help of specialised 3D systems software, from the initial diagnosis to the precise tooling of the aligner series itself, all of which reduces error margins to a minimum. Using the data obtained with our software, the models are prepared directly for each set up following a completely digitalised process. This allows us to avoid a multitude of mistakes that may take place with more traditional methods. This digital processing also reduces considerably the production costs, which result in a more affordable product for the client. The final cost will depend on the number of splints that the final customised treatment shall include. What steps should I follow to start my Alineadent treatment? First of all, consult your dentist and let them analyse and assess your case. They will then make an impression of your teeth. This will be sent to the lab where we will design and develop a plan for your treatment. Finally, your dentist will inform you of the time and cost of the whole therapy. Your dentist will also give you the aligners that you will have to wear at each stage of the treatment, plus a series of indications that you must follow during the whole process. What should I eat during the treatment? Contrary to what is the case with braces, you may eat anything you want, as you can take the aligners off to eat and drink. This is also an advantage with respect to non removable orthodontic systems, as it improves your oral hygiene. How long should Alineadent be worn? Two weeks for each aligner and at least 22 hours a day. According to the studies, this is the ideal period to effect the movement properly. The aligners should only be removed for eating and brushing your teeth. How should I clean Alineadent? 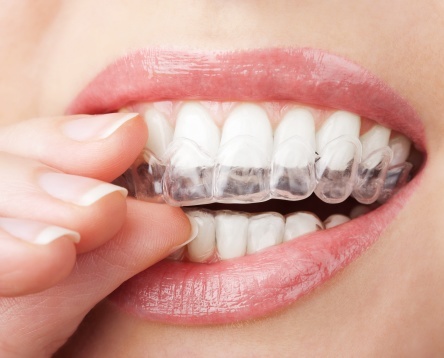 The best way to clean the aligners is brushing and washing them in lukewarm water. In order to maintain an adequate oral hygiene it is important that you brush your teeth after each meal and before putting the aligners back on. Some people may experience a slight passing discomfort during the first days of each new stage of the treatment, when they start wearing a new aligner. This is normal and it’s usually described as a sensation of pressure. This indicates that the aligners are working well, gradually moving the teeth and helping you to obtain the desired result. This discomfort should disappear in a few days.